Be the first to share your favorite memory, photo or story of Skylar. This memorial page is dedicated for family, friends and future generations to celebrate the life of their loved one. Skylar McKenzie Piety, age 25, of Knoxville passed away suddenly Friday morning, October 19, 2018 in a motorcycle accident on his way to work. He was employed at Smokey Mountain Tops on Ball Camp Pike, Knoxville, TN. He is preceded in death by his brothers, Sherman Ivan and Zachery Enoch Piety. He is survived by his parents, Dr. Kenneth Piety, Ms. Linda Gordon and by more brothers, sisters and family than you can imagine. 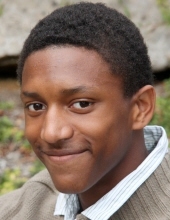 Skylar is a graduate of Christian Academy of Knoxville where he was involved in theater. His junior year he was the school’s Warrior mascot. Skylar loved to run and ran many miles every time he went running. His Facebook name was Sky Maverick; he had his own U-tube channel under the name Scooter Sky Pie. Skylar was known for his sweet smile and creative imagination. Please join us Tuesday, October 23 from 5-7:00 p.m. at Parkwest Church located at 7635 Middlebrook Pike, Knoxville 37909 for the receiving of friends followed by a Memorial Service at 7:00. Click Funeral Home Middlebrook Chapel is serving the Piety family. To send flowers or a remembrance gift to the family of Skylar McKenzie Piety, please visit our Tribute Store. "Email Address" would like to share the life celebration of Skylar McKenzie Piety. Click on the "link" to go to share a favorite memory or leave a condolence message for the family.